The Storefront Boutique theme is a well designed and organised WordPress theme which is rich in features and functionalities. This theme is the best option for those people who want to sell few items or products. It offers a minimalistic design to attract maximum number of visitors. 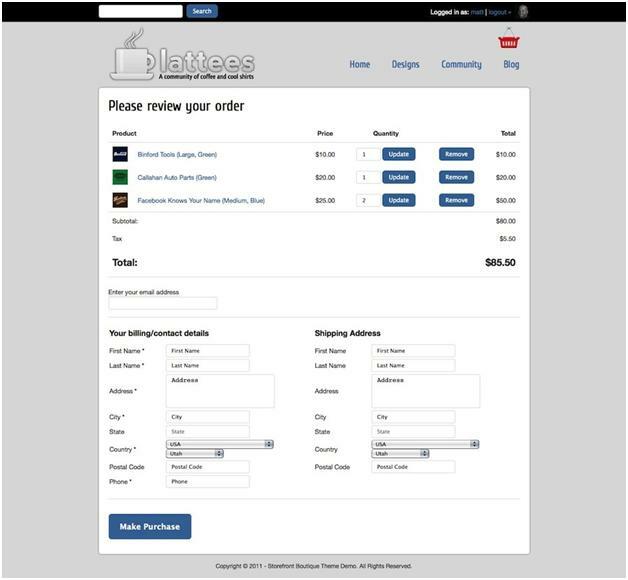 The Storefront Boutique has included a powerful and Complete BuddyPress Support. The regular design options included by the theme are background, logo, colour-picker, and so on. This wonderful WordPress theme also allows users to choose from the four different container widths, including homepage slider. The homepage design includes some very nice coin slider features which can be customized easily utilizing custom post types for publishing content. The theme option panel allows for complete configuration thereby simplifying the theme working process. The Facebook option feature allows you to include the Facebook Like box on all the product pages. The customers will simply click the Like button and your page will automatically be published to the friend’s news feeds, thereby multiplying your website’s exposure. There are three different colour options to choose from, for the Fancybox shopping cart. The shop’s account page and checkout page are designed to look more attractive and inviting. The theme includes beautifully designed account pages and shop’s check-out pages so that your website becomes a joy to use. The Fnacybox effect is for all product galleries, blog thumbnails, and images as well. The newly designed and beautiful looking product image gallery is offered on single product pages which have the ability to automatically adapt itself according to the size of the individual image. The grid view is stylish and includes price tag options for every product. The Unified search feature allows your website visitors to access pages, products, and posts from a single page or place, thereby saving their time and energy. The new search bar feature offered by this WordPress theme gives users a brand new registration and login bar which will be found on the page’s top section. The latest login form styles will use the website logo automatically along with the background colour for the log-in page. The theme can be translated into different languages like Spanish, German, Portuguese, and many other languages so that non-English users can also use the theme for designing their website beautifully. This new comment option feature added to the theme will allow users to enable the product comment option so that their visitors can comment on the displayed products. The shop templates are included inside the theme folder which in turn eases customization. The customization and the drop-down feature are of special importance because they help you to create the website which best suits your purpose of designing it. The slider option provides a refreshing look and feel to your website and thereby attracts more visitors. When a number of images and data items are included in the website, then loading speed becomes slow and this is the major drawback faced by this theme.